Amaranth is the common name for any of the typically annual (rarely perennial) plants of the flowering plant genus Amaranthus, characterized by small, often green or reddish flowers arranged in dense clusters, stems and leaves that are likewise deeply pigmented, and dry, indehiscent, one-seeded fruit. Also known as pigweed, there are about seventy species in this cosmopolitan genus of herbaceous plants. While it is not a true grain or cereal because the plant does not belong to the grass family (Poaceae), amaranth, like quinoa, is known as a "pseudograin" because the flavor, appearance, and cooking of many species exhibit similarities to grains. Amaranth seeds can be used as a cereal or ground into a flour and they contain exceptionally complete protein for plant sources. Besides protein, amaranth grain provides a good source of dietary fiber and dietary minerals such as iron, magnesium, phosphorus, copper, and especially manganese. The leaves also are consumed as a nutritious leaf vegetable, being used both in cooking and salads. Like quinoa, amaranth was once a staple of pre-Colombian cultures and is touted as a grain of the future for its good nutritional value. Culturally, the amaranth flower has been used as a symbol of immortality since the time of Ancient Greece with even its Greek-derived name meaning "one that does not wither," or the never-fading flower. Such use is seen in works of poetry, fables, and songs. 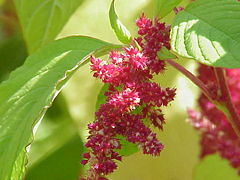 The Amaranthus genus is one of about 160 genera in the flowering plant family Amaranthaceae. Members of this family have simple leaves that are opposite or alternate, with margins entire or coarsely toothed, and without stipules. The flowers are solitary or aggregated in cymes, spikes, or panicles and typically perfect (bisexual) and actinomorphic. A few species have unisexual flowers. The bracteate flowers are regular with 4 to 5 petals, often joined. There are 1 to 5 stamens. The hypogynous ovary has 3 to 5 joined sepals. Collectively known as amaranth (or pigweed), the Amaranthus genus is a cosmopolitan taxon of herbs. Approximately 70 species are presently recognized, with inflorescences and foliage ranging from purple and red to gold. Members of this genus share many characteristics and uses with members of the closely related genus Celosia. Amaranthus shows a wide variety of morphological diversity among and even within certain species. Although the family (Amaranthaceae) is distinctive, the genus has few distinguishing characters among the 70 species included (Juan et al. 2007). The flowers tend to tiny and bunched together in long, dense, conspicuous racemes, with from zero to five perianth segments and two or three sytles. The fruits are dry, indehiscent, and one-seeded. Amaranth seeds may range from buff to dark purple in color, although most amaranth sold commercially is pale yellow (WH 2005). The fact that Amaranthus has few distinguishing characters and there is a wide diversity of morphological diversity among the species complicates taxonomy and Amaranthus has generally been considered among systematists as a “difficult” genus (Costea and DeMason 2001). Formerly, Sauer (1955) classified the genus into 2 sub-genera, differentiating only between monoecious and dioecious species: Acnida (L.) Aellen ex K.R. Robertson and Amaranthus (Costea and DeMason 2001). Although this classification was widely accepted, further infrageneric classification was (and still is) needed to differentiate this widely diverse group. Currently, Amaranthus includes 3 recognized sub-genera and 70 species, although species numbers are questionable due to hybridization and species concepts (Judd et al. 2008). Infrageneric classification focuses on inflorescence, flower characters, and whether a species is monoecious/dioecious, as in the Sauer (1955) suggested classification (Juan et al. 2007). A modified infrageneric classification of Amaranthus was published by Mosyakin & Robertson (1996) and includes 3 subgenera: Acnida, Amaranthus, and Albersia. The taxonomy is further differentiated by sections within each of the sub-genera (Mosyakin and Robertson 1996). Although amaranth is cultivated on a small scale in various parts of the world, including in parts of Mexico, Guatemala, Peru, India, and Nepal, and various African nations such as Nigeria, there is potential for further cultivation in the United States and tropical countries and it is often referred to as "the crop of the future" (Marx 1977). It has been proposed as an inexpensive native crop that could be cultivated by indigenous people in rural areas for several reasons: 1) it is easily harvested, 2) it produces a lot of fruits (and thus seeds), which are used as grain, 3) it is highly tolerant of arid environments, which are typical of most subtropical and some tropical regions, and 4) it contains large amounts of protein and essential amino acids, such as lysine (De Macvean and Pöll 2002). Due to its weedy life history, amaranth grains grow very rapidly and their large seedheads can weigh up to 1 kilogram and contain a half-million seeds (Tucker 1986). 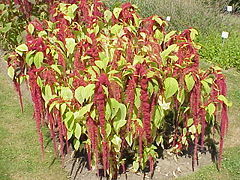 Amaranthus species are reported to have a thirty higher protein value than cereals such as rice, wheat flour, oats, and rye (De Macvean and Pöll 2002). A traditional food plant in Africa, amaranth has potential to improve nutrition, boost food security, foster rural development, and support sustainable land care (NRC 2006). Amaranth seeds and leaves are a very good source of vitamins, including vitamin A, vitamin K, vitamin B6, vitamin C, riboflavin, and folate, and dietary minerals including calcium, iron, magnesium, phosphorus, potassium, zinc, copper, and manganese. Both the seeds and leaf are high in protein, including the amino acid lysine. Amaranth seeds, like buckwheat and quinoa, contain protein that is unusually complete for plant sources (WH 2005). Like quinoa, another staple crop of pre-Colombian cultures, amaranth contains the essential amino acid lysine, which is deficient in wheat and barley. Most fruits and vegetables do not contain a complete set of amino acids, and thus different sources of protein must be used. Several studies have shown that like oats, amaranth seed or oil may be of benefit for those with hypertension and cardiovascular disease; regular consumption reduces blood pressure and cholesterol levels, while improving antioxidant status and some immune parameters (Czerwiński et al. 2004; Gonor et al. 2006; Martirosyan et al. 2007). While the active ingredient in oats appears to be water-soluble fiber, amaranth appears to lower cholesterol via its content of plant stanols and squalene. Because of its valuable nutrition, some farmers grow amaranth today and it is seen a potentially important agricultural crop of the future. However, their moderately high content of oxalic acid inhibits the absorption of calcium and zinc, and also means that they should be avoided or eaten in moderation by people with kidney disorders, gout, or rheumatoid arthritis. Reheating cooked amaranth greens is often discouraged, particularly for consumption by small children, as the nitrates in the leaves can be converted to nitrites, similarly to spinach. Amaranth seeds can be used as cereal or ground into flour, for such purposes as making bread (Herbst 2001). Several species are raised for amaranth grain in Asia and the Americas. Ancient amaranth grains still used to this day include the three species, Amaranthus caudatus, Amaranthus cruentus, and Amaranthus hypochondriacus (Costea et al. 2006). Amaranth grain is a crop of moderate importance in the Himalaya. It was one of the staple foodstuffs of the Incas, and it is known as kiwicha in the Andes today. It was also used by the ancient Aztecs, who called it huautli, and other Native America peoples in Mexico to prepare ritual drinks and foods. To this day, amaranth grains are toasted much like popcorn and mixed with honey, molasses, or chocolate to make a treat called alegría (literally, "joy" in Spanish). Amaranth was used in several Aztec ceremonies, where images of their gods (notably Huitzilopochtli) were made with amaranth mixed with honey. The images were cut to be eaten by the people. This looked like the Christian communion to the Roman Catholic priests, so the cultivation of the grain was forbidden for centuries. Because of its importance as a symbol of indigenous culture, and because it is very palatable, easy to cook, and its protein particularly well suited to human nutritional needs, interest in grain amaranth (especially A. cruentus and A. hypochondriacus) was revived in the 1970s. It was recovered in Mexico from wild varieties and is now commercially cultivated. It is a popular snack sold in Mexico City and other parts of Mexico, sometimes mixed with chocolate or puffed rice, and its use has spread to Europe and other parts of North America. Amaranth species are cultivated and consumed as a leaf vegetable in many parts of the world. Amaranth greens, also called Chinese spinach, hinn choy or yin tsoi (Simplified Chinese: 苋菜; Traditional Chinese: 莧菜; pinyin: xiàncài), callaloo, thotakura (telugu) , tampala, or quelite, particularly are a common leaf vegetable throughout the tropics and in many warm temperate regions. 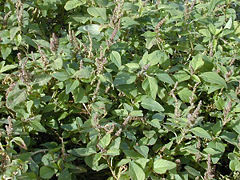 Amaranth is very popular in Andhra Pradesh. Amaranth greens can be used both in cooking and for salads and has a delicious, slightly sweet flavor (Herbst 2001). There are 4 species of Amaranthus documented as cultivated vegetables in eastern Asia: Amaranthus cruentus, Amaranthus blitum, Amaranthus dubius, and Amaranthus tricolor. In Indonesia and Malaysia, leaf amaranth is called bayam, while the Tagalogs in the Philippines call the plant kulitis. In Andhra Pradesh, India, this leaf is added in preparation of a popular dal called thotakura pappu. In China, the leaves and stems are used as a stir-fry vegetable and called yin choi (苋菜; pinyin: xiàncài; and variations on this transliteration in various dialects). In Vietnam, it is called rau dền and is used to make soup. There are two species popular as edible vegetable in Vietnam: dền đỏ- amaranthus tricolor and dền cơm or dền trắng- amaranthus viridis. In East Africa, amaranth leaf is known in Swahili as mchicha. It is sometimes recommended by some doctors for people having low red blood cell count. Also known among the Kalenjin as a drought crop (chepkerta). In West Africa, such as in Nigeria, it is a common vegetable, and goes with all Nigerian carbohydrate dishes. It is known in Yoruba as efo tete or arowo jeja ("we have money left over for fish"). In CongoTemplate:Clarify it is known as lenga lenga or biteku teku (Enama 1994). In the Caribbean, the leaves are called callaloo and are sometimes used in a soup called pepperpot soup. 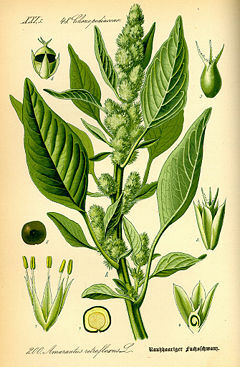 In Greece, green amaranth (Amaranthus viridis) is a popular dish and is called vleeta. It is boiled, then served with olive oil and lemon like a salad, usually alongside fried fish. Greeks stop harvesting the (usually wild-grown) plant when it starts to bloom at the end of August. The flowers of the 'Hopi Red Dye' amaranth were used by the Hopi Amerindians as the source of a deep red dye. There is also a synthetic dye that has been named "amaranth" for its similarity in color to the natural amaranth pigments known as betalains. This synthetic dye is also known as Red No. 2 in North America and E123 in the European Union. The genus contains several well-known ornamental plants, such as A. caudatus (love-lies-bleeding), a native of India and a vigorous, hardy annual with dark purplish flowers crowded in handsome drooping spikes. Another Indian annual, A. hypochondriacus (prince's feather), has deeply-veined lance-shaped leaves, purple on the under face, and deep crimson flowers densely packed on erect spikes. Amaranth has been used widely by the Chinese for its healing chemicals, used to treat illnesses such as infections, rashes, and migraines. Not all amaranth plants are cultivated. Most of the species from Amaranthus are summer annual weeds and are commonly referred to as pigweeds (Bensch et al. 2003). These species have an extended period of germination, rapid growth, and high rates of seed production (Bensch et al. 2003) and have been causing problems for farmers since the mid-1990s. This is partially due to the reduction in tillage, reduction in herbicidal use, and the evolution of herbicidal resistance in several species where herbicides have been applied more often (Wetzel et al. 1999). The following 9 species of Amaranthus are considered invasive and noxious weeds in the United States and Canada: A. albus, A. blitoides, A. hybridus, A. palmeri, A. powellii, A. retroflexus, A. spinosus, A. tuberculatus, and A. viridis (USDA). The species Amaranthus palmeri (Palmer amaranth) causes the greatest reduction in soybean yields and has the potential to reduce yields by 17 to 68 percent in field experiments (Bensch et al. 2003). Palmer amaranth is among the “top five most troublesome weeds” in the southeast and has already evolved resistances to dinitroanilines and acetolactate synthase inhibitors (Culpepper et al. 2006). This appearance of the new strain of the Palmer amaranth that is glyphosate-resistant means that it cannot be killed by the widely used Roundup herbicide. Also, this plant can survive in tough conditions. This makes the proper identification of Amaranthus species at the seedling stage essential for agriculturalists. Proper herbicide treatment needs to be applied before the species successfully colonizes in the crop field and causes significant yield reductions. The amaranth flower is one of the symbols of immortality and has been used as such a symbol since the time of Ancient Greece. Indeed, the word comes from the Greek amarantos (Αμάρανθος or Αμάραντος), meaning the "one that does not wither," or the never-fading (flower). The original spelling is amarant; the more common spelling amaranth seems to have come from a folk etymology assuming that the final syllable derives from the Greek word anthos ("flower"), common in botanical names. The fact that the flower does not soon fade has lead to it typifying immortaility in poetry and other works. Aesop's Fables (sixth century B.C.E.) compares the rose to the amaranth to illustrate the difference in fleeting and everlasting beauty. Joachim du Bellay mentioned the herb in his "A Vow To Heavenly Venus," ca. 1500. In ancient Greece, the amaranth (also called chrysanthemum and helichrysum) was sacred to Ephesian Artemis. It was supposed to have special healing properties, and as a symbol of immortality was used to decorate images of the gods and tombs. In legend, Amarynthus (a form of Amarantus) was a hunter of Artemis and king of Euboea; in a village of Amarynthus, of which he was the eponymous hero, there was a famous temple of Artemis Amarynthia or Amarysia (Strabo x. 448; Pausan. i. 31, p. 5). Bensch, C. N., M. J. Horak, and D. Peterson. 2003. [0037%3AIORPAR2.3.CO%3B2&ct=1 Interference of redroot pigweed (Amaranthus retroflexus), Palmer amaranth (A. palmeri), and common waterhemp (A. rudis) in soybean]. Weed Science 51: 37-43. Retrieved February 9, 2009. Costea, M., D. Brenner, F. Tardif, Y. Tan, and M. Sun. 2006. Delimitation of Amaranthus cruentus L. and Amaranthus caudatus L. using micromorphology and AFLP analysis: An application in germplasm identification. Genetic Resources and Crop Evolution 53: 1625-1633. Retrieved February 9, 2009. Culpeppera, A. S., T. L. Grey, W. K. Vencill, et al. 2006. Glyphosate-resistant Palmer amaranth (Amaranthus palmeri) confirmed in Georgia. Weed Science 54: 620-626. Retrieved February 9, 2009. Czerwiński, J., E. Bartnikowska, H. Leontowicz, et al. 2004. Oat (Avena sativa L.) and amaranth (Amaranthus hypochondriacus) meals positively affect plasma lipid profile in rats fed cholesterol-containing diets. J. Nutr. Biochem. 15(10): 622–9. PMID 15542354. Retrieved February 9, 2009. De Macvean, A. L. E, and Pöll. 2002. Chapter 8: Ethnobotany. J. A. Vozzo, Tropical Tree Seed Manual. Washington, D.C.: U.S. Dept. of Agriculture, Forest Service. OCLC 51763101. Enama, M. 1994. Culture: The missing nexus in ecological economics perspective. Ecological Economics 10: 93–95. Gonor, K. V., A. V. Pogozheva, S. A. Derbeneva, G. Mal'tsev, E. N. Trushina, and O. K. Mustafina. 2006. The influence of a diet with including amaranth oil on antioxidant and immune status in patients with ischemic heart disease and hyperlipoproteidemia. Vopr Pitan 75(6): 30–3. PMID 17313043. Retrieved February 9, 2009. Juan, R., J. Pastor, M. Alaiz, and J. Vioque. 2007. Electrophoretic characterization of Amaranthus L. seed proteins and its systematic implication. Botanical Journal of the Linnean Society 155: 57-63. Retrieved February 9, 2009. Judd, W. S. et al. 2008. Plant Systematics: A Phylogenetic Approach, 3rd edition. Sunderland, MA: Sinauer Associates. ISBN 9780878934072. Lenz. 1859. Botanik der alt. Greich. und Rom. (Botany of Old). Martirosyan, D. M., L. A. Miroshnichenko, S. N. Kulakova, A. V. Pogojeva, and V. I. Zoloedov. 2007. Amaranth oil application for coronary heart disease and hypertension. Lipids Health Dis 6: 1. PMID 17207282. Retrieved February 9, 2009. Marx, J. L. 1977. Speaking of science: Amaranth: A comeback for the food of the Aztecs? Science 198 (4312): 40. Mosyakin, S. L., and K. R. Robertson. 1996.New infrageneric taxa and combinations in Amaranthus (Amaranthaceae). Ann. Bot. Fennici 33: 275-281. Retrieved February 9, 2009. Murr, J. 1890. Die Pflanzenwelt in der griech. Mythol. (Plants in Greek Mythology). National Research Council (NRC). 2006. Lost Crops of Africa. Volume II, Vegetables. Washington, D.C.: National Academy Press. ISBN 9780309103336. Tucker, J. 1986. Amaranth: The once and future crop. Bioscience 36(1): 9-13. United States Department of Agriculture (USDA). n.d. Amaranthus L. (pigweed). USDA Plant Database: Plants Profile. Retrieved February 9, 2009. Whole Health (WH). 2005. Amaranth. Whole Health. Retrieved February 9, 2009. This page was last modified on 10 March 2016, at 17:09.